Longview Analytics is the ideal environment for the creation and distribution of highly customized business intelligence and reporting solutions for mobile and desktop deployment. The software enables access to more than 20 data sources in one application, offering high flexibility and fast implementation. Longview Analytics has been rated as #1 in various categories in The BI Survey 16 (2016), including ‘Visual Design Standards’, ‘Operational BI’ and ‘Big data analytics’. 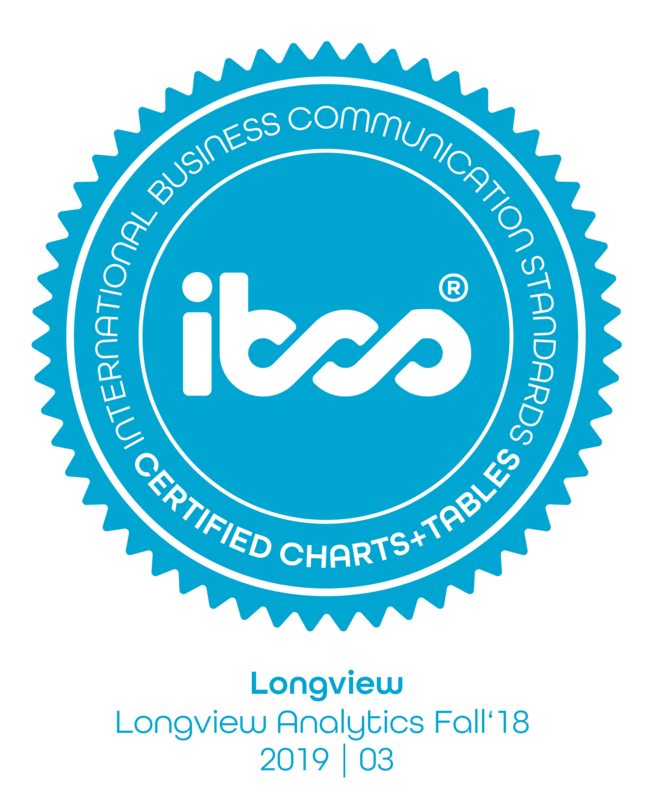 Longview Analytics Fall’18 has successfully passed the examination in accordance with the provisions of the IBCS® software re-certification process. Longview Analytics Fall’18 (formerly arcplan 8) initially was certified in March 2014. The visual design of the presented business charts an tables is certified to be compliant with the Standards proposed by the IBCS Association. Chart template 01: Stacked columns ... Additionally template 01 shows an example of how the central message of the report could be updated after analyzing the content. Chart template 02: Stacked bars sorted by region The stacked bar charts in template 02 vary by different groups and sort orders. Template 02 is also implemented in a version which can be dynamically sorted by clicking on the cart labels. Comments are realized using built-in text objects and linked with comment markers consisting of group images and numbers. 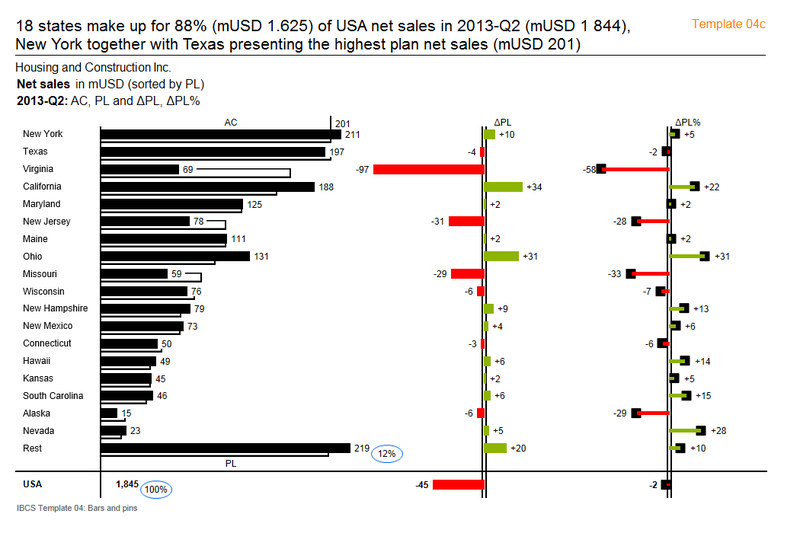 Chart template 04c: 3-tier bar chart with pins Template 04 consists of three horizontal bar charts in various forms. The pin chart on the right side is realized with a combination of a column and a symbol chart. The templates of this set can vary by different sort order which can be switched dynamically. Chart template 09c: Chart with points and two value axes This template arranges product points in a chart with two value axes for “Net sales” and “Margin”. 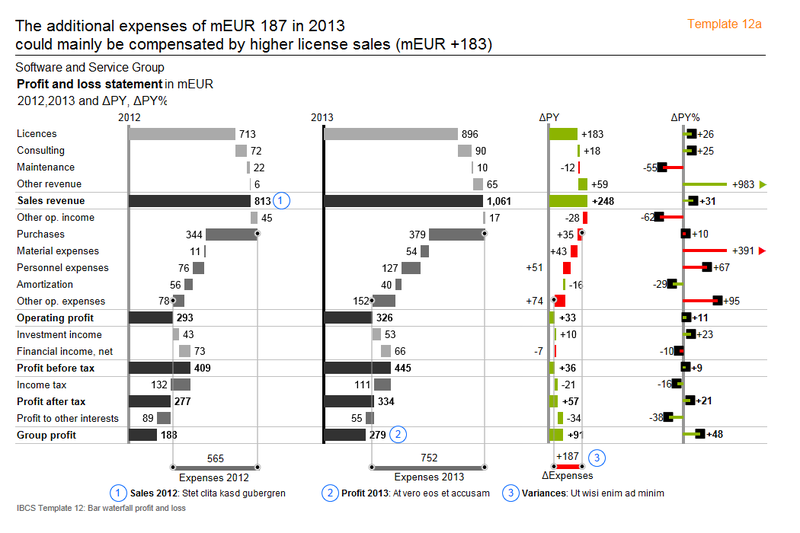 The plane of the diagram is clustered by lines of equal “Gross profit” realized with a pre-calculated background image. 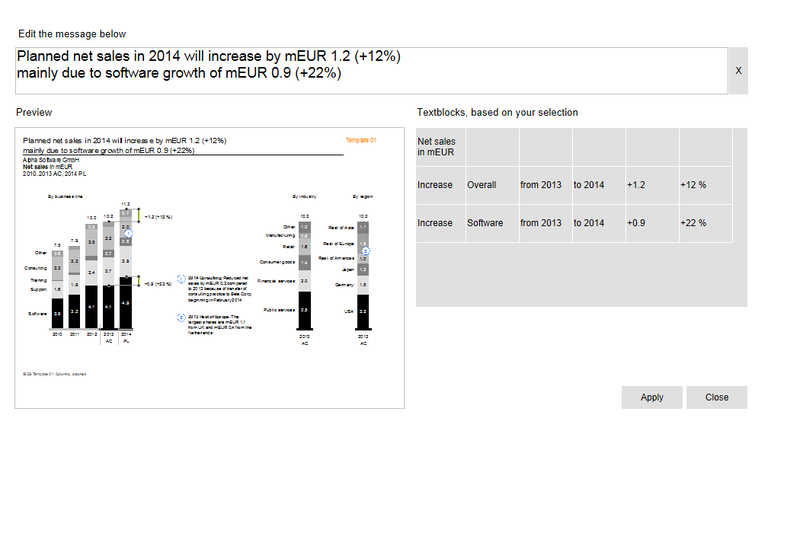 Chart template 11: Ratio tree Template 11 consists of vertical bar charts showing several years. The charts are arranged in order of their logical context. Lines and symbols are used to build a tree-like structure. Chart template 12a: Vertical waterfall for a profit & loss calculation schema The vertical waterfall chart in template 12 is complemented by two charts showing the absolute and relative difference to the planned values. 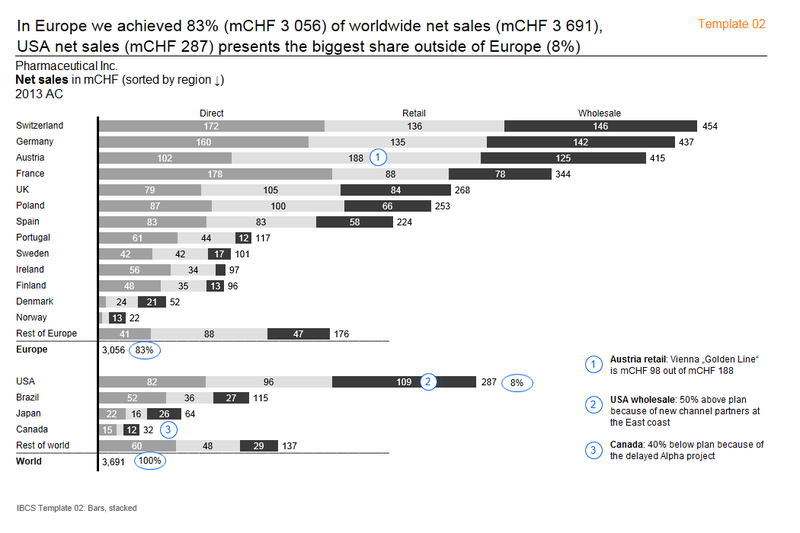 Outliers in the pin chart are cut off by a calculated maximum value and visualized in a separate symbol chart. Chart template 13: Small multiples of column charts Template 13 consists of several small multiples. 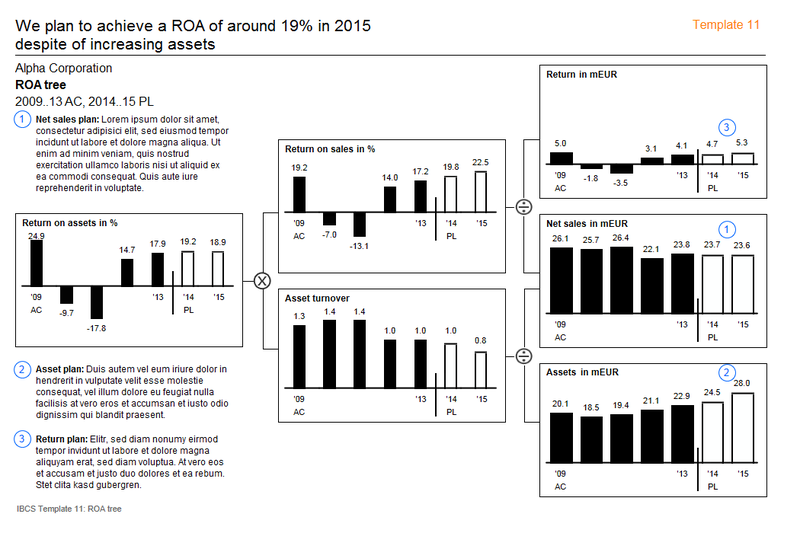 One outlier chart is given more space while keeping the consistent scaling intact. In the variant 13b the deviation is shown relative to an average line. 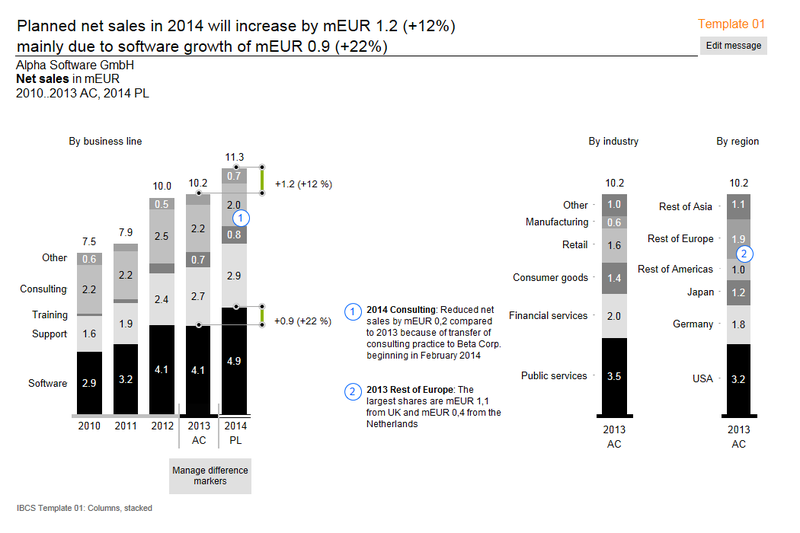 This is realized using a stacked column chart with invisible parts. 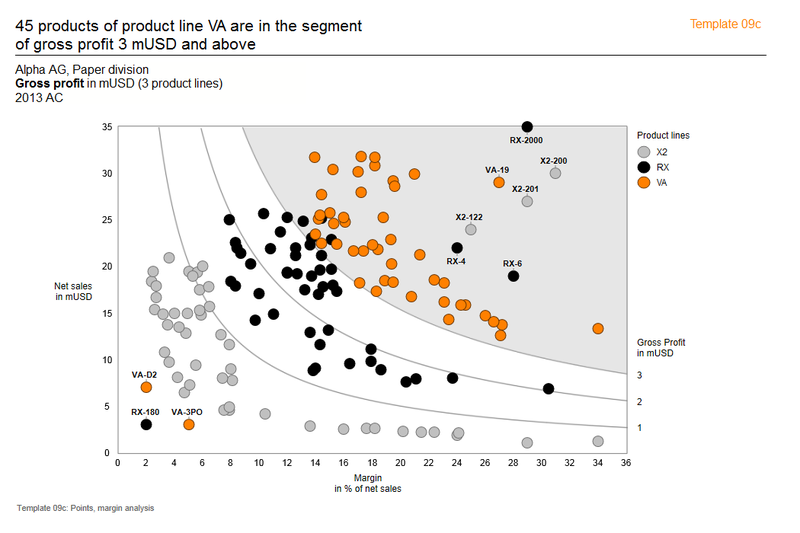 Chart template 13b: Small multiples of column charts In the variant 13b the deviation is shown relative to an average line. This is realized using a stacked column chart with invisible parts. The first IBCS® certification presented quite a positive surprise, even good reasons for enthusiasm for the certification team. With the help of six templates, Longview impressively proved that arcplan 8 meets the visual charting design requirements to the fullest extent. The testing for user friendliness conducted by BARC also showed positive results. 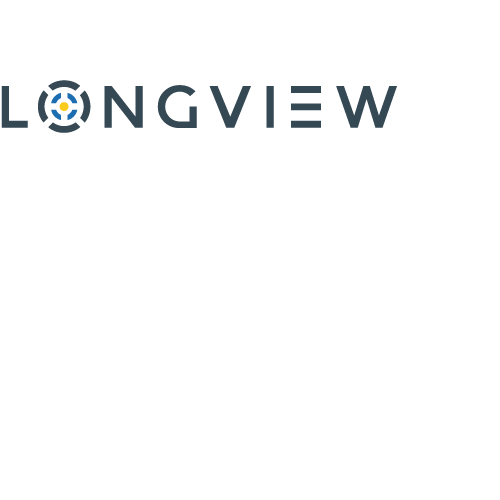 Founded in 1994, Longview provides leading corporate performance management (CPM), tax, and business intelligence (BI) solutions to enterprises across industries worldwide.